Sometimes I have to just set my manhood aside and drink something a little... girly. This is the 2010 Little Black Dress Merlot which comes out of Mendocino County California. Judging by the label, this is obviously geared toward the female wine drinkers out there. The issue I have with this is that regardless of whatever they put on the label, it's still a Merlot, which in the wine world isn't really gender stereotypical like something such as White Zinfandel. And even with White Zin, who is to say a guy can't enjoy it? Sure, it's sweet, but it's intended to be. That's the style. My point is, they could have put skulls and scantily clad women on this label, but it'll still be the same Merlot inside! But back to Little Black Dress Merlot, which is obviously marketed toward the females out there. I find it interesting, if not a tad clever, that the label does not actually have a little black dress on it, just a clothes hanger and a pair of heels. So, is this really an effeminate wine? 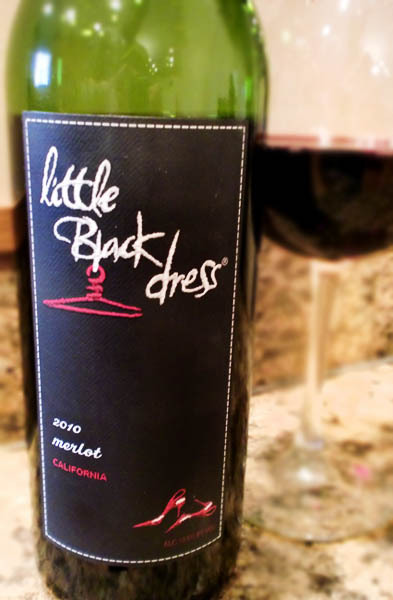 Well, let's see..
Little Black Dress Merlot pours a deep maroon and has aromas of sweet black cherries and soft vanilla. Tasting brings predominant black cherry, a touch of plum, and a hint of oak. It's a bit thinner than I prefer my merlots, but not bad overall, just simple. This is exactly the kind of merlot I could see a group of girls drinking in the evening while they sit around talking. It's not too heavy, not heavily oaked, and fairly sweet. It's a straightforward Merlot, for sure, and fits its target market. Were the label to be more gender neutral, maybe even a touch manly, I'd say it was just okay, but for its intended female drinkers (who tend to prefer a lighter style), it's decent and only costs $9-11 per bottle depending on where you buy it. This paired well enough with my grilled ribeye even though I, personally, would have preferred something a bit heavier and tannic. Oh well, it at least was worth tasting. Drink This: if you want a straightforward, cherry-forward Merlot. Don't Drink This: if you're looking for a heavily oaked, complex Merlot. Not that some girls don't like that kind of wine, but I'm willing to bet the label will scare away many a male wine drinker. Just not this guy! What do you recommend for a cocktail dress?